The Book of Eli takes the violent, gritty feel of a spaghetti western, marries it with elements of The Road, places it in the future and gives it a spiritual twist. 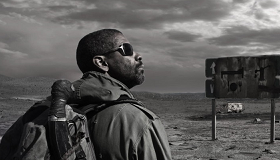 Denzel Washington is a loner who has been travelling across a desolate land for 30 years, feverishly clutching onto the only Bible still in existence-a book bad guy Gary Oldman desperately wants to steal. Naturally, Denzel devotees and action fans should line up early, but with some crafty targeted marketing Eli could also score big with the same Christian crowd that made The Passion Of The Christ into a worldwide phenomenon. Opening over the Martin Luther King holiday weekend should be huge. Directing team The Hughes Brothers (Menace II Society, From Hell) have chosen Eli as their first film in nearly a decade and though it certainly delivers all the fireworks you might come to expect from their earlier work, its religious undertones separate it from the pack and make it a must-see for Bible-belters too. Somewhere in the "not-too-distant future," 30 years after a catastrophic war, a lone man with dark glasses and a backpack wanders through what little is left of America. Eli (Washington) comes in peace, but also carries a piece, along with martial arts skills that would tame the greatest kung fu masters. He stops every villainous culprit in his way in order to survive and protect what he believes is the key to the future of humanity. Standing in his way is Carnegie (Oldman), the one man who clearly knows where Eli is coming from and is determined to get his book in the belief that if its in his possession he can control what remains of the world. Complicating matters is Carnegie's adopted daughter, Solara (Mila Kunis), who soon falls under the spell of the mysterious stranger. Despite being set in the future the Hughes Brothers and screenwriter Gary Whitta know this is the stuff classic westerns are made of. The lawless Old West and the lawless, post-apocalyptic New West have much in common. Eli, a man of few words and lots of action calls to mind Clint Eastwood's Man With No Name in the Sergio Leone spaghetti westerns. Eli is presented as one of the few men left who actually have any memory of just what the world was like before it ended, and Carnegie, his main nemesis, is just about the only person in a town full of stooges who seems to realize what is at stake. It sets up a great showdown in the tradition of Rio Bravo. Washington is at the top of his game, comfortably fitting into the loner role with ease and authority. Oldman is wickedly good in full evil mode. Kunis is ideally cast in the key female role, while Jennifer Beals does nicely in a less defined role as Carnegie's blind wife. Other supporting roles are well played: Frances de la Tour and Michael Gambon are refreshing comic relief as an odd old couple Eli encounters. With riveting action that never stops, The Book of Eli gets the year off to a spectacularly exciting start at the movies and should keep turnstiles turning. Rating: R for some brutal violence and language.